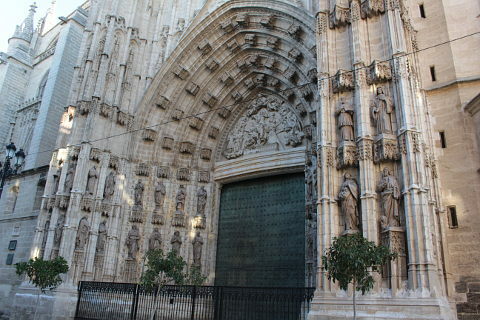 Seville cathedral is one of the key sights of a visit to Seville. It is the largest Gothic cathedral in the world. Beautiful on the outside it also has a lot to see on the inside. 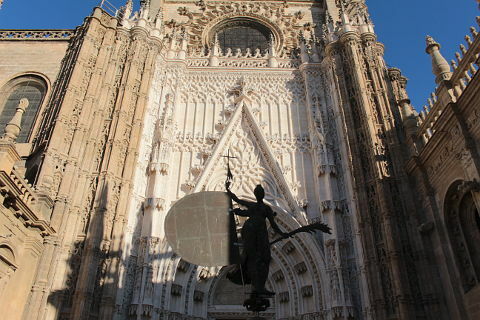 Seville cathedral is a UNESCO World Heritage Site. 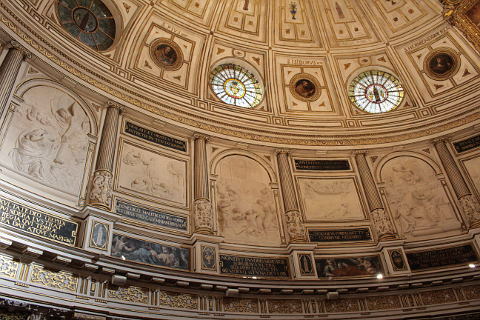 Seville cathedral stands in the heart of Seville in the unmissable area where the cathedral, the Alcazar, the General Archive of the Indes and the pretty Plaza do los Reyes all meet. The cathedral is huge, indeed it is the largest Gothic cathedral in the world and it is very beautiful from the outside with its flying buttresses and beautiful Giralda tower, the lower half of which was the minaret for the mosque that once stood here. We pondered queing and paying the reasonably expensive entrance price but in the end we were very glad we did so. Not only is there lots to see inside but the entrance fee includes the Giralda tower from the top of which you get some fabulous views over the city. One of the key sights in the cathedral is the High Alttar which depicts scenes of the Old and New Testament through over one thousand sculptures. 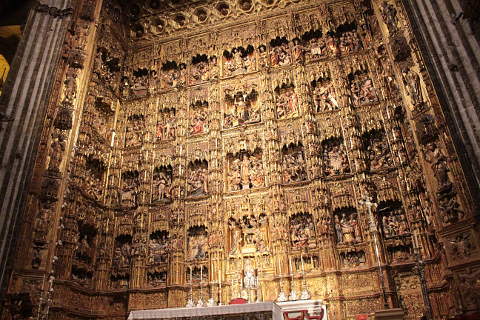 It is one of the largest altarpieces in the world. 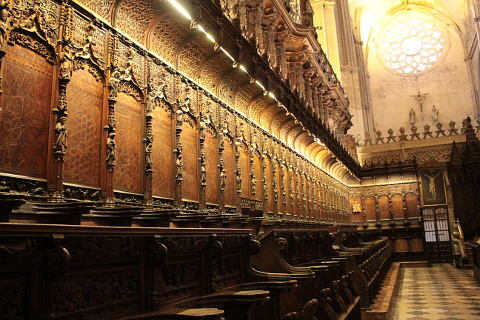 The beautifully carved seats of the Choir and the lovely Chapter house and adjjoining buildings are further highlights of the visit. 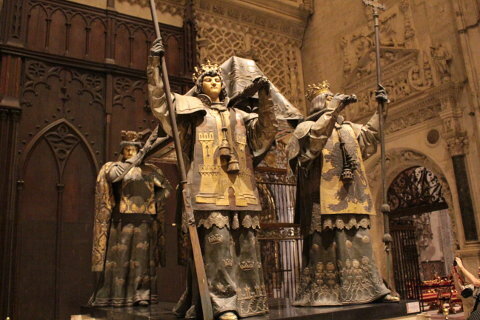 On the right hand side of the central nave is the tomb of Christopher Columbus supported by statues of four heralds representing the kingdoms of Aragon, Castile, Leon and Navarre. The beautiful stained glass windows of the cathedral are Flemish and date from the 16th century and there are more than 500 paintings which range from the 16th century to modern times. 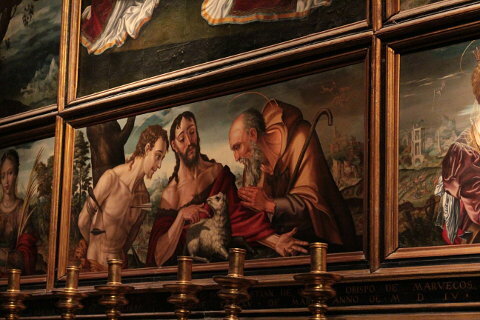 Key among them are "the descent from the cross" by Pedro de Campana, "Saint Ferdinand receives the kes to the city" by Francisco Pacheco and "Saint Ferdinand" by B E Murillo. 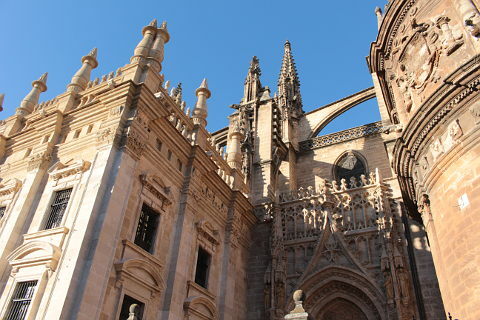 A highlight to a visit to the cathedral is also the access to the Giralda tower. 35 ramps lead you on a steep climb to the top where you can see some fabulous views over the city. 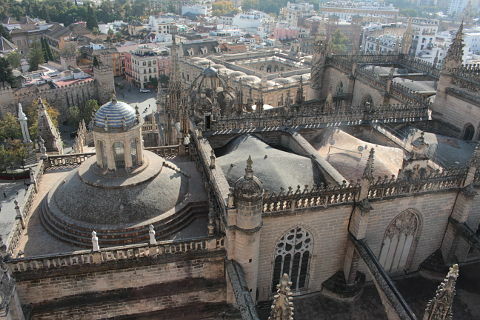 You alos get a close up view of the 25 vells of the Giralda bellfry each of which has its own name. The bells of San Miguel and Santa Cruz date back to the year 1400. 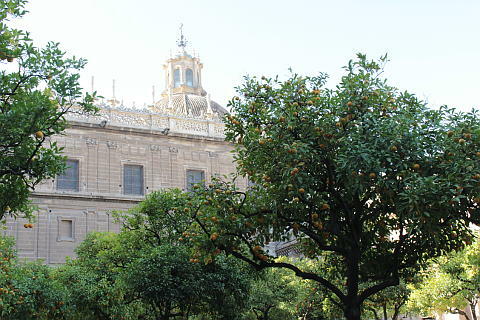 There is a large courtyard inside the cathedral filled with orange trees. This patio remains from the Great Mosque of Seville and is where the Muslims carried out their ablutions before going in to worship. 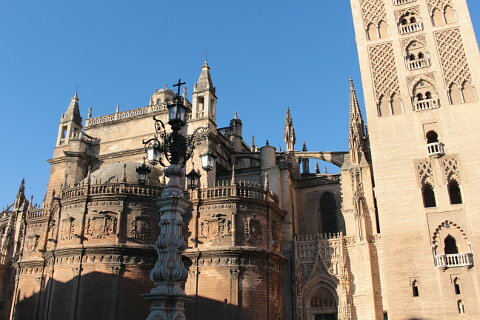 The cathedral is built on the site of the main mosque of Seville which stood her from 1184-1198. The lower sections of the Giralda tower was the minaret of the mosque and the Orange Tree Courtyard, the "Patio de Los Naranjos" also remains from these times. In 1248 following the Reconquest the mosque was consecrated as a cathedral and in 1434 construction of the Gothic cathedral began. Over the following centuries work continued with Renaissance sections added in the 16-17th centuries. This included the upper section of the Giralda tower and also the Royl Chapel, main Vestry and the Chapter House. A Baroque phase folowed in the 17-18 th century when the Parish Church of the Tabernacle was added. In 1987 Seville Cathedral was declared a UNESCO World Heritage Site along with the Alcazar and the General Archive of the Indes. In 2007 it was voted number three of the top twelve 'Treasures of Spain' in a national TV and radio competition. Your cathedral ticket gives you free entry to the nearby Divine Saviour Collegiate Church which has some amazing altar pieces and various notable works of art. Seville is packed with interesting historical sights. Key among them are the Alcazar, the Plaza de Espana, the Metrosol Parasol, the Casa Palacio de las Duenas, the Torre del Oro, the bullring, the Santa Cruz quarter and the El-Arenal quarter.